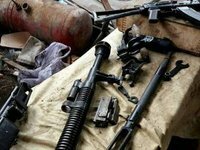 Rifle ammunition is stored in the territory of the sixth arsenal of Ukraine's Defense Ministry near the village of Druzhba (Ichnia district, Chernihiv region), where a fire started on Tuesday, Deputy General Staff Chief Rodion Tymoshenko has said. "There are no rockets or large caliber artillery systems stored at the facility. Large missiles, such as the Buk, and other large missile systems are not stored at the depot," he said. Tymoshenko said about 20% of ammunition stored are ammunition components. "As of 09:30 five storage areas were on fire. The intensity of the explosions has decreased and smoke has filled the air, making reconnaissance using quadrocopters difficult," he said. "Therefore, reconnaissance is being carried out directly on the ground. A fire tank with the appropriate crew has been put forward, who will see directly on the ground what to do, what are the causes and further actions to eliminate the fire," Tymoshenko said, adding the amount of ammunition stored in the warehouses is not public. Tymoshenko said the amount is not 88,000 tonnes, as some media have reported, but 1.5-2 times less.